After his capture a video was found that shows Khadr toying with detonating cord as other men including Abu Laith al-Libi assemble explosives in the same house that had been destroyed in the firefight. He was also seen planting landmines while smiling and joking with the cameraman. It has been suggested that these were the same landmines later recovered by American forces on a road between Gardez and Khowst- Wiki. 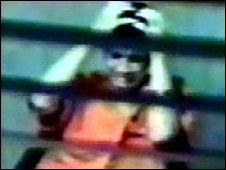 A teenage Omar Khadr sobs uncontrollably as Canadian spy agents question him at the U.S. military prison in Guantanamo Bay, Cuba, in a brief video excerpt released via the internet early Tuesday morning. The 10-minute video posted just after 5 a.m. ET is of poor quality and the voices are often inaudible, as it was never intended to be viewed by the public. But it shows Khadr, 16 at the time, being interviewed by Canadian officials in late February 2003. The excerpt is from five formerly classified DVDs consisting of 7.5 hours of questioning, six months after Khadr was captured following a 2002 firefight in Afghanistan. The tapes, made public under a court order obtained by Khadr’s lawyers, offer a rare glimpse of interrogations of Guantanamo detainees and of Khadr. He immediately became a darling of the left. This week Omar Khadr was released on bail. Omar Khadr arrived at his new home Thursday after almost 13 years behind bars — four of them as a convicted war criminal — and asked Canadians to give him a chance to show he’s worthy of their trust. “I will prove to them that I’m more than what they thought of me, I’ll prove to them that I’m a good person,” the former Guantanamo Bay prisoner said outside his lawyer’s home just hours after he was released on bail. He also reassured Canadians that he doesn’t believe in violent jihad.